A landmark study from a large team of UK investigators including our long-time SALSAmigos Profs. 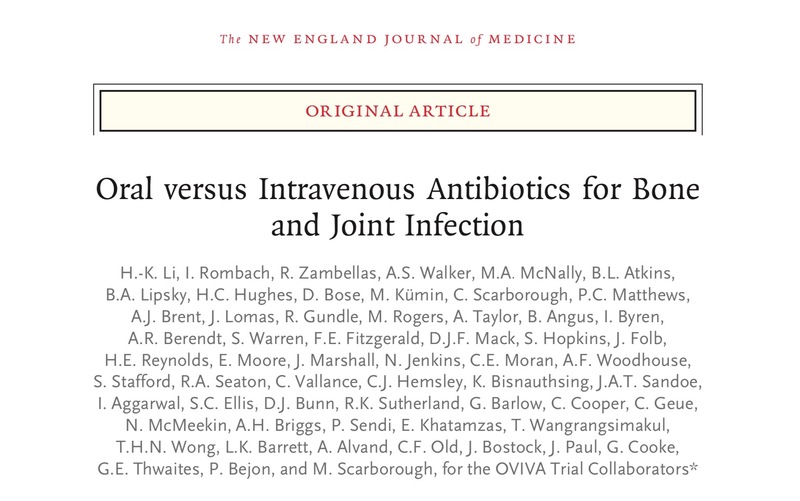 Ben Lipsky and Tony Berendt reports no difference in outcomes from Oral vs. IV antimicrobials for bone and joint infections. Bottom line: as we have said for many years- if a patient has a functioning gut…Choose the least complex option. Among the 1054 participants (527 in each group), end-point data were available for 1015 (96.3%). Treatment failure occurred in 74 of 506 participants (14.6%) in the intra- venous group and 67 of 509 participants (13.2%) in the oral group. Missing end-point data (39 participants, 3.7%) were imputed. The intention-to-treat analysis showed a difference in the risk of definitive treatment failure (oral group vs. intravenous group) of −1.4 percentage points (90% confidence interval [CI], −4.9 to 2.2; 95% CI, −5.6 to 2.9), indicating noninferiority. Complete-case, per-protocol, and sensitivity analyses supported this result. The between-group difference in the incidence of serious adverse events was not significant (146 of 527 participants [27.7%] in the intravenous group and 138 of 527 [26.2%] in the oral group; P=0.58). Catheter complications, analyzed as a secondary end point, were more common in the intravenous group (9.4% vs. 1.0%).